After 50 Years - Christ's Apostle Still Ahead of His Time! 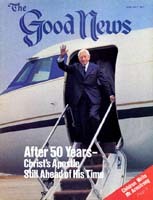 Fifty years ago this month - in June, 1931 - Herbert W. Armstrong was ordained into Christ's ministry. Five years earlier he had been challenged into a diligent study of the Bible. "By spring, 1927, my mind had been swept clean of the religious beliefs I had carelessly assumed, and Jesus Christ had come into my life.... I had been conquered by Christ Jesus. I repented, was baptized and a totally new life begotten in me," is the way Mr. Armstrong has described his conversion. Soon small groups of people in God's Church in rural Oregon began to urge him to speak before them. It became clear from the fruits borne even before Mr. Armstrong's ordination that God was calling him to do a special Work.